No visit to Wales is complete without a search of its vast pine plantations for the bird with that incredible twisted bill, the Crossbill.Amongst British birds it is unique with a bill specially designed for extracting seeds from pine-cones. 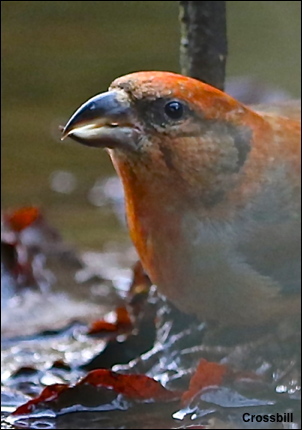 In Wales Crossbills lay their eggs in mid February so that in January there is plenty of activity as they pair off and commence nest-building. Unfortunately the immense size of the Welsh forests makes finding Crossbills very difficult. After a great deal of time we located a small number of birds drinking at a pool in some dense willows and I was able to obtain a couple of photos of them before they returned to the high pines.